Okra with no slime? 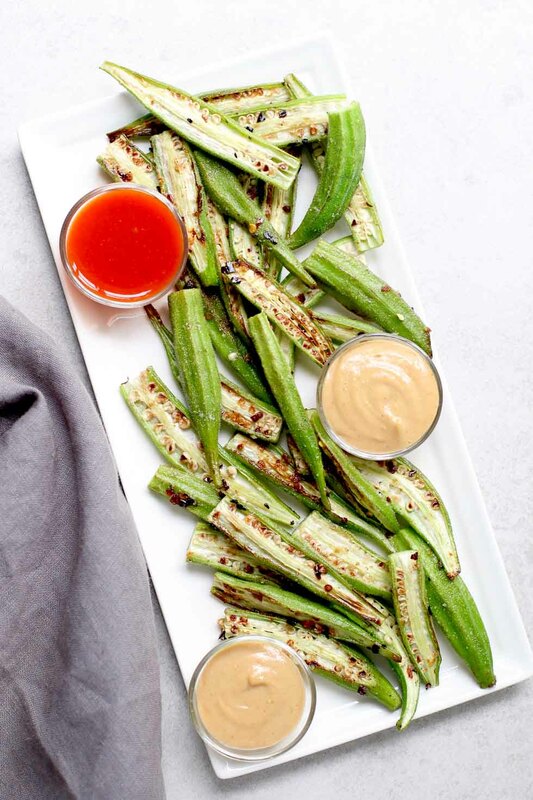 This spicy, crispy roasted okra with ginger peanut dipping sauce has got you covered! Fresh okra is spiced up and roasted to perfection. I love okra. I like this fuzzy green fruit pretending to be a vegetable a little more than the average person. Okra has a unique flavor and effortlessly thickens soups and stews. “The slime” that so many people hate is what gives okra its thickening power. If sliminess isn’t your thing… there is a way around it. Don’t overcook it. This polarizing pod has a lot to offer when it comes to nutrition. Okra is an excellent source of vitamin C and a good source of magnesium, folate and soluble fiber — the kind that helps reduce blood cholesterol and the risk for heart disease. I’ve joined with a group of food bloggers to share our favorite southern summer flavors. I thought up recipes for watermelon, peaches, blueberries, sweet corn, and tomatoes but decided to go out on a limb with the vegetable that people love to hate – OKRA. It gets a bad rap but it’s also going to be around for a while. Okra is in season when it’s hot here in the south, from now until October. Yeah. You can make this recipe today and until the beginning of boot season! For this recipe, I simply sliced the pods in half and roasted with a little sesame oil, salt and red pepper flakes. They are delicious just as is but the ginger peanut sauce adds a a sweet and nutty flavor balance. It makes a perfect warm and filling appetizer, side dish or snack. 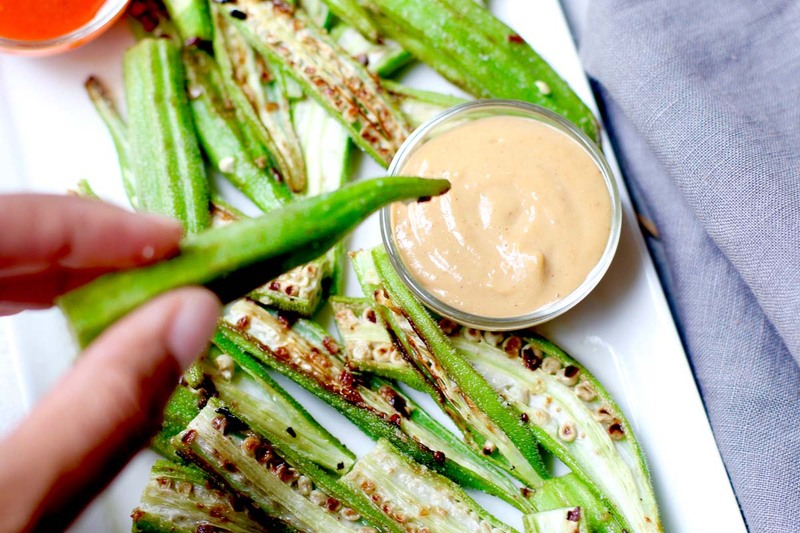 So, give okra one more chance with this roasted okra recipe. Seriously. The roasting might change your mind. Using fresh, good-quality okra is essential. I usually get it from my farmers market and cook it within a day or two. And here’s a tip. Buy small okra pods – about the length of your finger – with bright green color. These are the most tender and flavorful. Skip the larger pods, which tend to be tough and woody. Ready to dive in? Grab the easy recipe below. But before you go, I’d love to hear your favorite way to eat okra? I’m always looking for new recipes, so please share in the comments and be sure to tag me on Instagram @marisamoore if you make this recipe! And to find the other recipes in the collection be sure to follow #SouthernSummerFlavors on Instagram, Twitter, and Facebook today. Okra with no slime? Add this spicy, crispy roasted okra recipe to your list. It's an easy vegan, gluten-free appetizer or snack! Preheat the oven to 425°F. Wash and dry the okra. Slice off the tops and cut the okra lengthwise. Place the cut okra onto a baking sheet, leaving plenty of space between each piece. Drizzle with sesame oil. Sprinkle with the red pepper flakes and salt to taste. 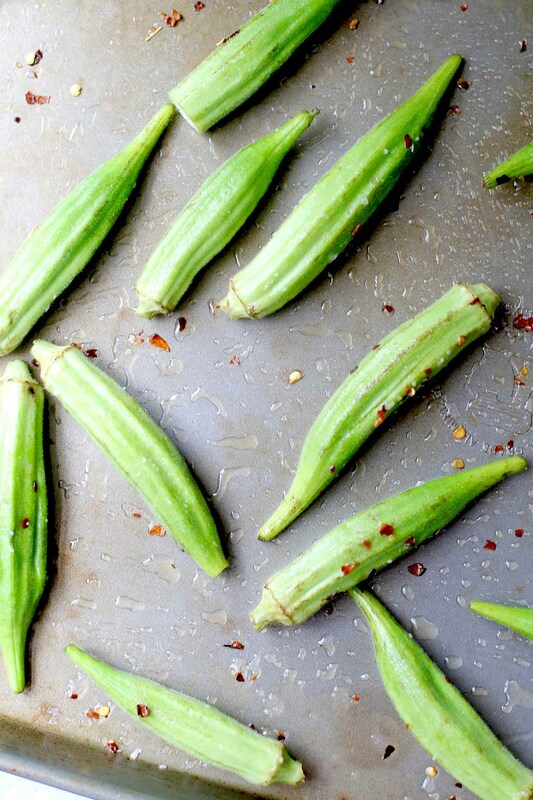 Roast the okra for 10-12 minutes, turning once. Remove from the oven and enjoy as a warm snack or side dish. 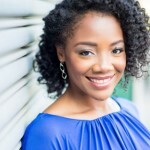 Combine all ingredients using a whisk or blender for a smoother finish. This Looks absolutely delicious and nutritious too Marisa. I love it. It's so good made that way! I buy it frozen when it's not in season. It's a great addition to soups and stews! But there's nothing like fresh okra this time of year. I'm not a fan of okra. I have never personally cooked it, yet I have had a few pieces of fried okra in the past. 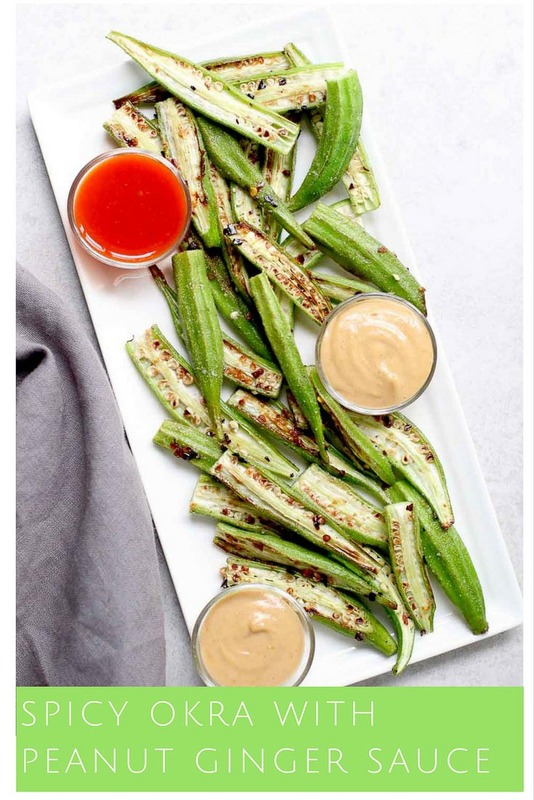 I purchased okra just for this recipe. The dish was delicious as written. I will cook this again. It makes a great appetizer.